BRUSSELS, March 5, 2018 - AVA was awarded the SEAL of Excellence within EU Framework Programme for Research and Innovation 2014-2020. The award was offered for the project proposal submitted by AVA under Horizon 2020’s SME instrument phase 2. 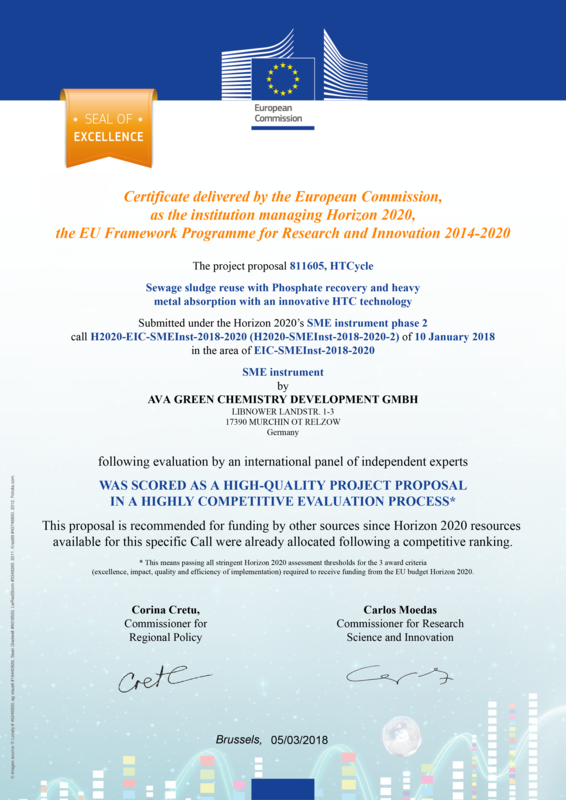 The project 811605, HTCycle which refers to the sewage sludge reuse with phosphate recovery and heavy metals absorption with an innovative HTC technology was scored as a high-quality project proposal in a highly competitive evaluation process. The evaluation was based on three criteria required to receive funding from the EU budget Horizon 2020: excellence, impact, quality and efficiency of implementation. The Seal of Excellence is the high-quality label awarded to projects submitted to Horizon 2020 which were deemed to deserve funding but did not receive it due to budget limits. It recognises the value of the proposal and supports the search for alternative funding. The Seal of Excellence Certificate rewards unfunded proposals which are above the quality threshold with a high-quality label and the Seal of Excellence holder can then approach alternative regional, national, private or public funding sources. In addition, it helps interested funding bodies willing to invest in promising proposals (including national & regional authorities through European Structural & Investment Funds) to identify these projects more easily.